Ever notice w/ emoji how there isn't a simple smiley? Like sometimes is just a little too excited when all I'm really looking for is ":)"
@lamshein92 @sherlynfung OR MAYBE......you can deliver it over to my house.Then I'll keep it safe until she comes homeGreat idea, no? 04 Oct 11 copy & paste +upvote -downvote @lamshein92 @sherlynfung OR MAYBE......you can deliver it over to my house.Then I'll keep it safe until she comes homeGreat idea, no? @BIANQUITACALDER feliz cumple que te la pases súper bn abrazos y besos!!! 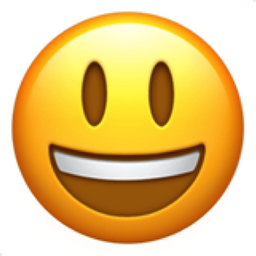 Like Smiling Face with Open Mouth Chronological Emojitweets 6?